Leonid Pasternak (1862-1945), father of the writer Boris Pasternak, was a leading Russian artist with a reputation as a fine portraitist. Boris Pasternak (1890-1960), the eldest son of Leonid, the Russian poet and author of Doctor Zhivago, was awarded the Nobel Prize for Literature in 1958. Leonid Pasternak: A Family Collection is a permanent exhibition of Leonid’s work in the Oxford house where he lived during the last six years of his life and where he died. It is open to the public on the first Sunday of every month, 2.30 - 4.30 pm, by appointment. 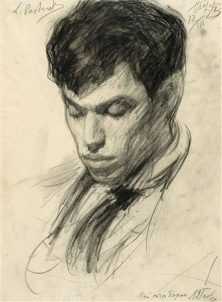 The Pasternak Trust archive includes an extensive collection of Leonid Pasternak’s artistic works in all media and from all periods of his life, and images (mostly tiffs) of many of those works of his that are not owned by the Trust. 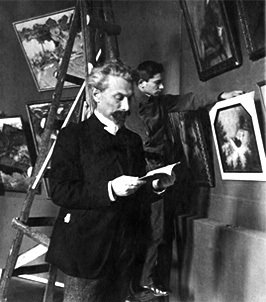 It also has a full collection of family photographs, covering the Pasternak family in its entirety from 1880 to 1921 and himself, his wife, and their two daughters from 1922 to 1945; a full set of exhibition catalogues; a selection from his personal library, and early editions of his published works. It also has a complete photographic biography of Boris Pasternak, covering every year of his life. The Hoover Institution Archives The main body of the Pasternak Trust’s written archive is now owned by the Hoover Institution at Stanford University, California (https://www.hoover.org), to whom application should be made for study or reproduction for scholarly purposes. It includes Boris’s full correspondence with his sisters and parents, manuscripts, first editions of his works, and other family papers spanning over a hundred years. However, the archives will be closed for research and reference services during 2019 and the early months of 2020 because of a major demolition and construction project. Copyright in the archive is held by the Pasternak Trust, to whom application should be made (to info@pasternak-trust.org) for reproduction for commercial purposes.